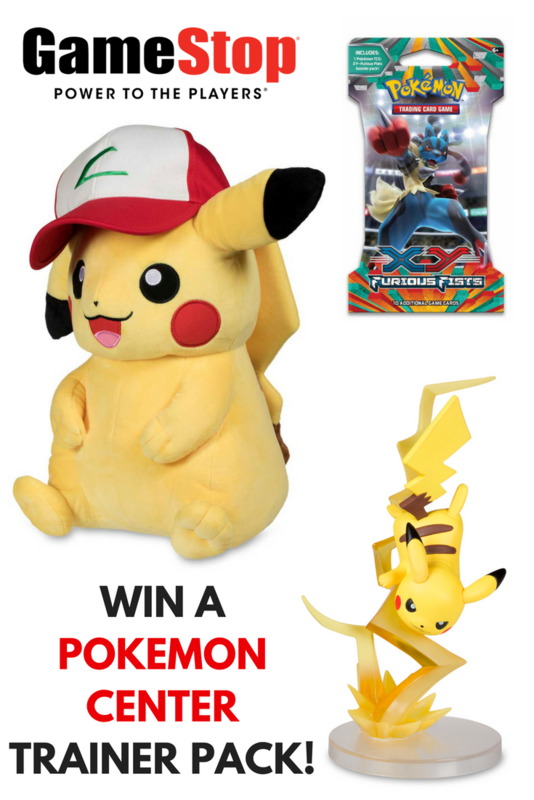 Giveaway: ReFun Your ReFund with the GameStop Refund Sale + Enter to Win A Tax Season Prize Pack! If you’re getting a tax refund this year (and I hope you are! ), you can get the biggest bang for Uncle Sam’s buck at GameStop with their two-week Refund Sale Event! 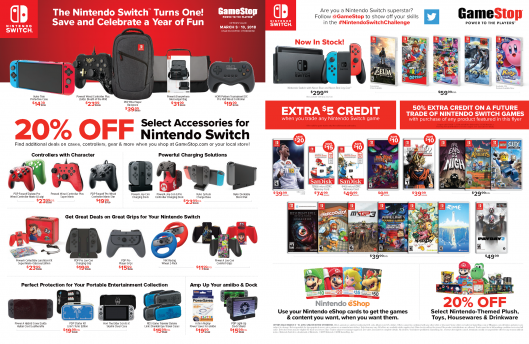 If that tax refund is burning a hole your pocket, don’t miss the chance to stretch your refund with tons of awesome deals at GameStop. 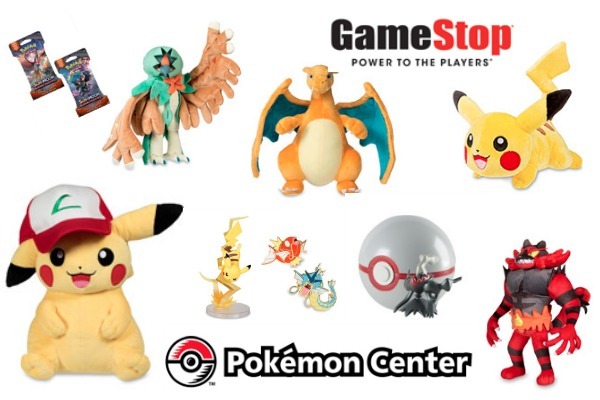 From Feb. 25 to March 6, GameStop is offering early-bird filers a way to multiply their hard-earned dollars with unbeatable savings and trade offers on a variety of games, consoles, accessories, toys, and apparel. 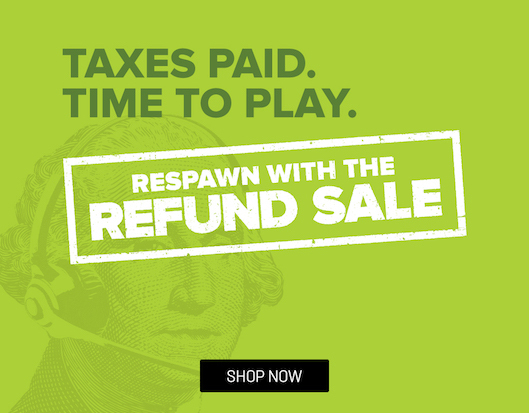 For the full line-up of refund sale deals, visit GameStop.com! 5 Gifts Star Wars Fans Will FREAK Over + Giveaway (ARV $230)! Star Wars is such a universally popular series. Chances are, you have at least one HUGE Star Wars fan on your shopping list this year. Yes? 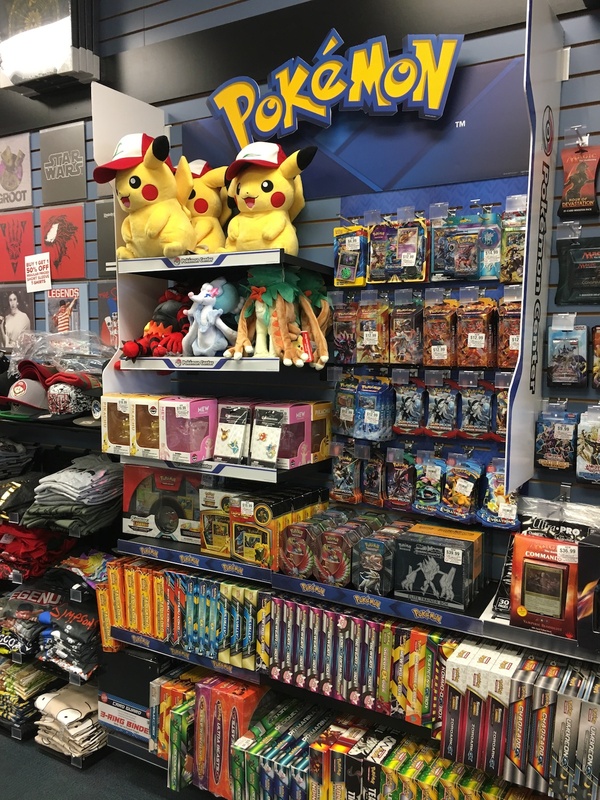 The good news is finding that perfect gift is only as difficult as heading to your nearest GameStop! Right now, GameStop is bursting at the seams with Star Wars gear that’s sure to make your favorite Star Wars fan totally freak out. Keep scrolling to see my top five Star Wars picks, plus some amazing offers at GameStop this week. 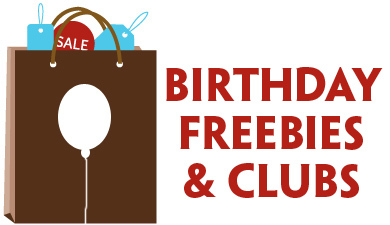 Oh, and there’s also a chance to win an AWESOME giveaway ($230 ARV!!!) too — so scroll, scroll, SCROLL! It’s the Fast-Dealing Property Trading Game taken to a galaxy far, far away! 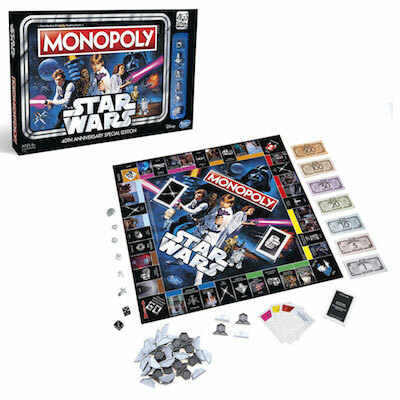 Celebrate the 40th anniversary of the original Star Wars movie with this special edition of the Monopoly game. Players can relive the story of Star Wars: A New Hope as they travel around the board. Collect memorable scenes and iconic ships inspired by the 1977 movie. Strengthen power and influence over opponents by building Fleets and Bases. Force and Smuggler’s Cargo cards shape players’ destinies in this exciting game. The only player left after everyone else has gone bankrupt wins! 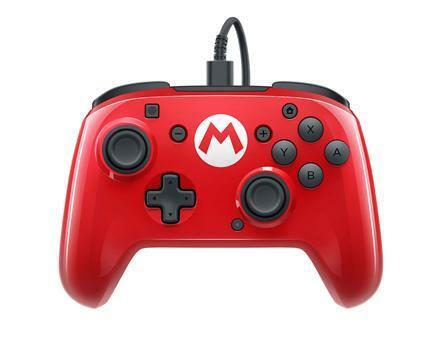 On sale for only $21! 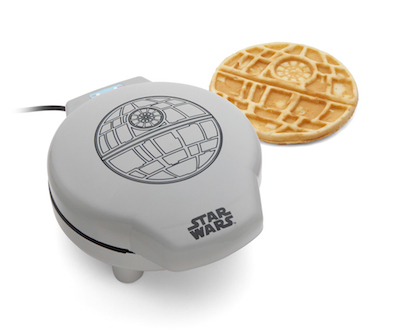 COME TO THE DARK SIDE; WE HAVE WAFFLES… The Death Star Waffle Maker is perfect for all your evil waffle needs. This Death Star, a ThinkGeek creation and exclusive, produces a 7″ diameter round waffle with two sections. We made Death Star waffles for brinner Sunday evening, and they were a massive hit!!! Jedi Knights, Sith Lords, Stormtroopers, X-Wings, Star Destroyers, AT-AT Walkers, droids, Wookiees, Rebel heroes, and more! Discover the exciting stories of good versus evil in a galaxy far, far away with the Star Wars: The Last Jedi Electronic Porg Plush. Small, flat-muzzled avians that flock about the rocks and roost in the cliffs of Luke Skywalker’s secluded island, porgs are inquisitive creatures. 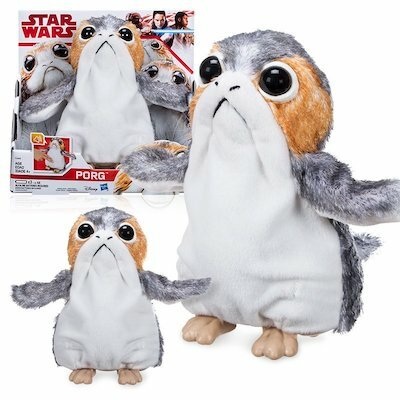 Imagine the porgs scuttling around their island home and spying on Jedi Master Luke Skywalker with this waving, wadding, flapping, chattering Porg plush! This soft plush creature waves and flap its arms, moves forward and turns, and includes porg sound effects – tweeting, chirping, and more! Inspired by the memorable porgs from Star Wars: The Last Jedi, the Porg plush is a perfect addition to any Star Wars collection. May the Force be with you! 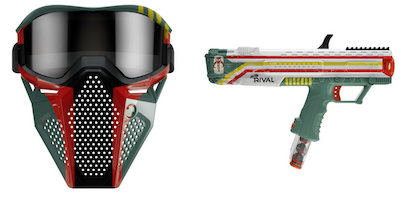 Gear up like a Mandalorian warrior with this Nerf Rival Apollo XV-700 blaster and face mask! 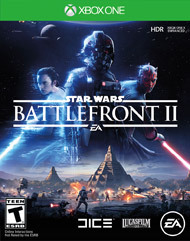 Inspired by the new Star Wars: Battlefront II video game and available exclusively at GameStop. This Nerf blaster is SO cool! 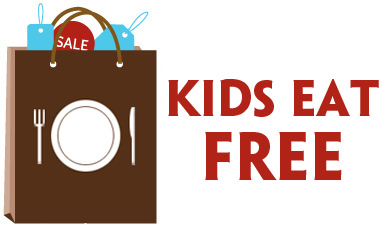 Check out the video Keri Lyn made demonstrating it. 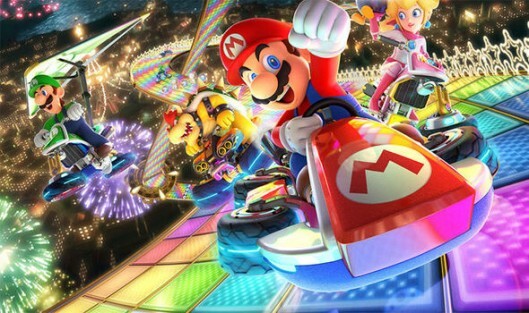 I CANNOT WAIT until my son opens it on Christmas morning — not just because he’s going to freak out, but also because I want to give it a try for myself! I’m not the only parent like this, right?! This interactive droid stands at a lifelike scale of 16 inches tall (19 inches with antenna)! It moves smoothly and is capable of realistic interactions – just like in the film! 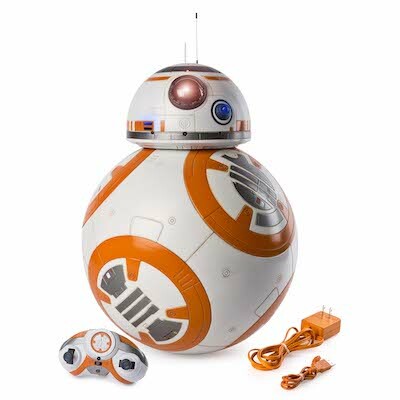 Set Hero Droid BB-8 to Follow Me mode and it will roll beside you just as loyally as it would follow Rey or Poe! With voice recognition and remote control capabilities, it is fully interactive and ready to spin into action. This Star Wars RC droid has authentic lights and sounds, plus film-accurate aesthetics, making it perfect for fans of all ages. Hero Droid BB-8 brings to life the amazing hero from Star Wars: The Last Jedi! Now you can re-create your favorite scenes from the movie or embark on new exploits with this RC droid by your side! Take home Hero Droid BB-8 from Spin Master and roll into adventure! From Dec. 11-16, GameStop is making your Star Wars shopping spree even sweeter with a special sale: Save 20% on ANY collectible (toy, figure, gadget, housewares or apparel), including the ones above, when you buy one of the season’s top gaming titles. For example, you can buy Star Wars Battlefront II (a MUST-HAVE for Star Wars lovers) and save $45 on a life-size Star Wars: The Last Jedi Hero Droid BB-8! Or save almost $20 on the Mandalorian Nerf Blaster — a GameStop exclusive! Win a Star Wars: The Last Jedi Hero Droid BB-8! 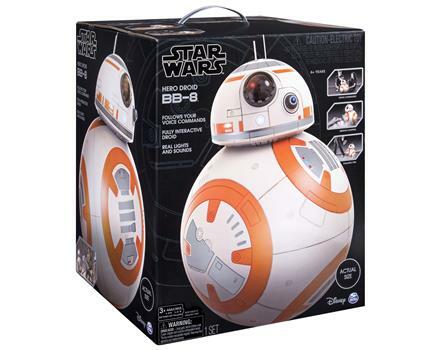 I’m so excited to share that one (1) lucky Deal Seeking Mom reader will win a Star Wars: The Last Jedi Hero Droid BB-8 from GameStop (ARV $230)!!! This thing is seriously COOL — even a casual Star Wars fan will totally freak out when they see just how big it is! 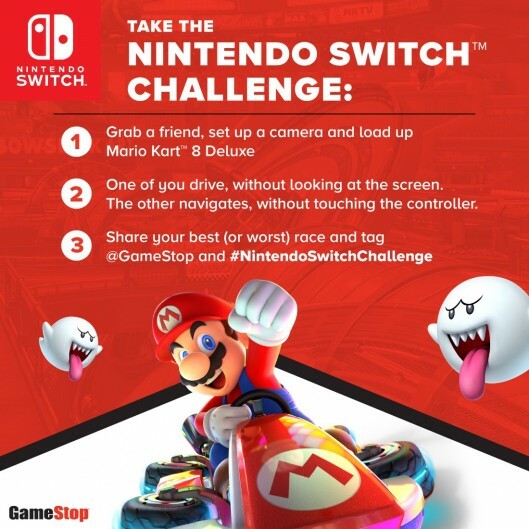 This giveaway is sponsored by GameStop, your source for everything Star Wars; all opinions and text are my own. Thank you for supporting the brands that support this site!